The original guest bathroom in the 1970s contemporary home needed updating. It had laminate countertops, inexpensive cabinetry, and vinyl flooring. The tub and tile had started to leak. 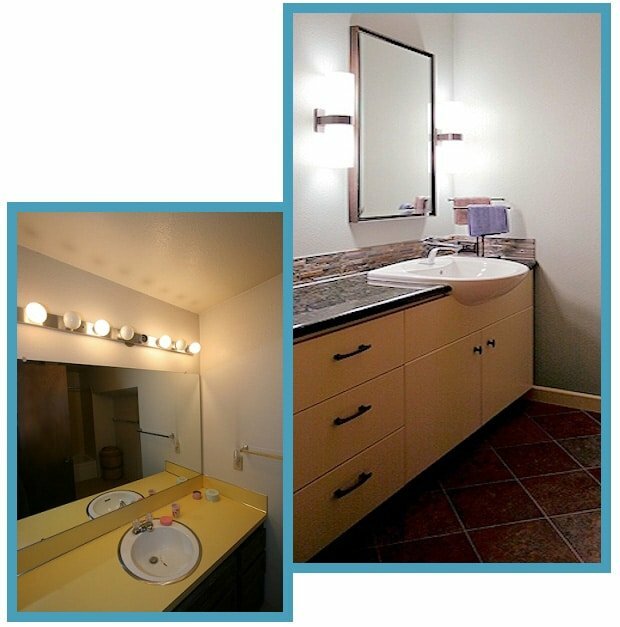 For the remodeled bathroom, Homeowners selected a European-style lavatory sink that extends beyond the countertop and cabinets, so new cabinets could be shallower (one foot was borrowed from the guest bathroom to make the adjacent master shower larger). The countertop is stone, and the new flooring is tile. Homeowners kept the original tub, and installed a new tile surround that goes from the top of the tub to the ceiling.